Nothing beats homemade tortillas made from scratch! The packaged tortillas you get at big American markets don’t even come close to a good, freshly made corn tortilla. Making homemade corn tortillas is actually almost ridiculously easy, once you get the hang of it. All you need is masa harina corn flour, water, a tortilla press (can use a rolling pin, but a tortilla press is helpful), and a hot griddle surface. You’ll need a special corn flour called masa harina for making the tortillas. Masa harina is corn flour that has been treated with calcium hydroxide or “lime” which makes it more nutritious by releasing the niacin in the corn, and easier to digest.
. Look for masa harina that is only corn and lime (calcium hydroxide) for corn tortilla making. You can make the tortillas completely by hand, by forming a thin pancake with the dough between your hands. But unless you are somewhat experienced in this method, you’ll get more consistent results by using a tortilla press. The wooden tortilla press pictured I purchased at a local Mexican market in town. You can also roll out the masa with a rolling pin, between pieces of plastic wrap or freezer bag plastic. 1 Mix masa flour with warm water: To make 16-18 tortillas, start with putting 2 cups of masa flour in a large bowl. Add 1 1/2 to 2 cups of very warm water to the masa flour (according to the directions on the package, some brands may call for different amounts of water). Mix in and let sit for 5 minutes or so. 2 Knead the dough: Begin working the masa with your hands to make the dough. Work the dough for several minutes. Press the dough with your fingers and the palms of your hands as if you were kneading bread dough. The dough will be a little gritty at first, but should become more pliable as you kneed it. If at any point through the tortilla making process the dough seems too dry or too wet, add a little more water or masa to the dough. 3 Form balls of dough: Pinch off a piece of the masa dough and rub it between your hands to shape it into a ball the size of a plum, or slightly large golf ball. Make about 16-18 balls from the dough. 4 Prepare the press with two sheets of plastic: Cut two pieces of plastic from a plastic freezer bag into the shape of the surface of the tortilla press. 5 Place ball of dough between the plastic sheets and press: Open the tortilla press and lay one piece of plastic on the press. Place the masa ball in the center. Place another piece of plastic over the masa ball. Gently close the press and press down, until the dough has spread to a diameter of 4 to 5 inches. 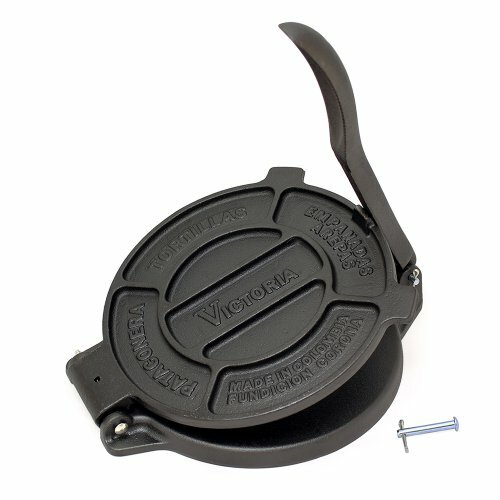 6 Heat a griddle or a large skillet on high heat. A well seasoned cast iron griddle or large cast iron pan works well for this. 7 Remove the raw tortilla from the plastic: Working one at a time, hold a tortilla in your hand, carefully removing the plastic on each side. 8 Lay the tortilla down on the hot pan: Allow the tortilla to rest half on your hand, and half hanging down, and gently lay the tortilla down on to the skillet. Start working on pressing the next tortilla. 9 Cook the tortilla on one side, then flip: Cook the tortilla on the hot pan for 30 seconds to a minute on each side. The tortilla should be lightly toasted and little air pockets forming. 10 Keep the tortillas warm, covered: Remove the tortillas to a tortilla warmer lined with dish towel or paper towels, or wrap them in a dish towel to keep them warm. Hello! All photos and content are copyright protected. Please do not use our photos without prior written permission. If you wish to republish this recipe, please rewrite the recipe in your own unique words and link back to How to Make Corn Tortillas on Simply Recipes. Thank you! Thanks for the detailed instructions. I added a pinch of salt to the dough. Didn’t have a tortilla press. Used skillet and cut out plastic bag to flatten initially and then rolling pin to get fairly thin. The tortilla peeled off very easily off the plastic wrap. I’ll admit I have practice rolling out and handling Indian wheat dough rotis. So these were no problem. I cooked on a cast iron griddle, on medium high heat. But mine didn’t get the dark brown charred marks as in the picture above. Will try higher heat next time. They puffed all the way up. Again because of the roti background I also tend to measure success by whether or not it puffs up all the way. Made these again today to go with smoky black bean soup. Remembered that last time they were a tad dry, so I added a little more water than the 1:1 ratio on the masa harina bag (Minsa). Maybe 2.25 C water for 2 C flour. Kneaded well for 5 minutes. The tortillas came out thin, soft and puffed well. I cooked them directly on the flame at the end, to get slight char marks. Yummy! For those looking for tricks to get them to puff – 1) put tortilla on a hot griddle 2) watch for color change on top side – goes from a white raw look to a slightly darker cooked color. Takes about 20 secs. 3) Flip and let sit undisturbed for another 20-30 seconds. Some puffing should start. If not, turn up heat more. Once a puff covers about a third of the tortilla, gently press on the puffed part with a spatula or wadded up dishcloth, to encourage the steam into unpuffed areas. If heat is enough, dough is wet enough and tortilla is rolled evenly, it should puff all the way around. Sometimes, I flip a second time to encourage puffing. I think I do that if it feels like the first side didn’t cook enough. Dang. Recipe works, but the trick is removing the pressed, uncooked tortilla from the wax paper. Even if successful in that endeavor, it has to transfer (sticky a bit) from my hand to the skillet flat and round…and I’m successful only about 30% of the time. Watering my hands? Spraying oil on the wax paper? Probably best to hire some Mexican grandma! Hi Chris, it’s easiest to use plastic from a large freezer bag. Works better than wax paper. If it’s sticking you’re either pressing too hard OR it’s too wet of a dough. I am failing miserably at making these! The dough sort of resembles wet sand, so I add a little water …now it’s too sticky. I went back and forth adding more water, then more masa until it looked alright. But when I tried forming the tortillas they just crumbled and stuck everywhere. Does anyone have any suggestions? Tips would be greatly appreciated! Hi Karin, these can be tricky, especially the first attempt or two. In fact, when I haven’t made them for a while it always takes me half a batch to get the hang of it again. Once you get the proportions right where it’s not too sticky and not too dry, then massage the dough with your hands for about 5 minutes. The more you knead it, the more pliable it should become. That will help a lot! Perfect! This is my second time trying to make tortillas- the first time I used a different recipe and was only moderately successful. This recipe, with Bob’s Red Mill Masa Harina and a tortilla press, made gorgeous tortillas! Thank you. Just for the record, limestone is first heated to above 825 degrees C to drive off the carbon dioxide. This leaves a product known as “quicklime”. The quicklime is then carefully treated with water (a process that evolves lot of heat causing boiling and spattering) to give “lime” or “slacked lime” which is used by masons when preparing mortar for laying bricks. The slaked lime is a strongly alkaline substance that is used to remove the hulls from kernels of maize (corn) as a preliminary step in the preparation of masa for masa harina. It is interesting to note that the very alkaline slaked lime also reacts with some of the fats in the maize to give small amounts of a calcium soap. This calcium soap is what gives corn tortillas made from masa harina a very special pleasant taste. Tortillas made from simple corn flour (made by grinding untreated maize) do not have this special taste. I just made these! They weren’t as pretty as yours, but only half made it to the lunch table. The other half were gobbled up by family members as soon as I got the tortillas off the griddle! Absolutely wonderful – it was so fast and easy that I can’t go back to store-bought. Thank you! I have great success using a plastic grocery bag (think wal-mart bag). I cut it a little larger than the press and it works wonderfully. I don’t have a tortilla press, but found that I can make excellent tortillas using a heavy plastic sandwich bag. Just slit the bag on the sides, so you have two pieces of heavy plastic that fold over on each other. Put the ball of masa dough between them, and press out with a rolling pin. Easy! The tortilla peels off the plastic cleanly. Can even wash it off and reuse. When you buy packaged corn tortillas they are in a stack with nothing in between each tortilla. Does anyone know how they are cooked to achieve this? I’d like to freeze a few homemade tortillas like I do with packaged, but I’m not sure how to do it. Anyone know how to get masa harina in Sweden, or tortillas already pressed and warmed (like they sell in the stores in California)? I use a clean produce bag from the grocery store. I just cut it at the sides and place that on my wooden press. I learned this from an old Mexican senora who brought my press from Michoacan. I also use 1 and 1/2 cups masa and 1/2 a cup white flour. She also taught me to press the tortilla with my fingers after I turned it. Where she is from, if the tortillas don’t puff up when they are turned, they are inferior! I tried it, MUY EXCELENTE! I used masa in a bag just like in the picture, different brand is all. I used a little of the masa to “flour” my hands to work the dough and form the balls. Flattening it was the best part of this fun experiment, I borrowed a friend’s rolling pin but I ended up using a really neat, easy method: Take a gallon-size ziploc bag and cut the Ziploc side and the two sides off, so you end up with a nice piece of flat plastic with a crease so it opens and closes like a book. Use a little butter or oil, lard, etc to oil up the plastic a little, now the dough won’t stick at all. Put your dough ball down on the plastic and close the other half down on it then just squish flat with a saucepan. You can look, and feel, if you’re getting it flat enough all around. Peel away the top, then lay the tortilla on your hand and peel away the back. Gently flop the tortilla onto your hot, greased, pan. re-oil the plastic for each one. Learn to gently poke the tortilla with your spatula to tell when it’s done, it will have a little bit of spring to it. I used a large Pyrex bowl with a pot lid on top for an improvised tortilla steamer. I put two paper towels on the bottom and two on top. Unfortunately my friend didn’t want to eat tortillas, although he told me they’re up to the standard of a Mexican restaurant here we rave about. I had to eat 15 of them! The final six, I made an egg frittata, with chopped garlic in it and adobo seasoning, cut that in 6 pieces, and put a piece in each tortilla with some Sriracha sauce for tongue-burning goodness. I would love to see corn tortillas replace pancakes, and a bunch of other things in the US. Viva tortillas! Is that a homemade tortilla press? I’ve never seen a wood version. Finally found one at an antique store to give my fiancée last christmas. We love it! Our comal is looking a little sad — might need to search for a new one soon. I love fresh cooked corn tortillas, and want to use them when I cook enchiladas. I’ve got a killer recipe for them. My question is, once I press out the tortillas, how do I prepare them for use in enchiladas? Thanks for the recipe! I’m going to try making tortillas this week. Luckily you can find masa harina in the UK in the specialty aisle. Camila – hominy is corn flour that has been treated with lime – if it’s a fine grind then it can be used as masa harina. If it’s a coarse grind, you may want to process it in a food processor to refine it before you use it. Good luck! Does anyone know if I can make tortillas with hominy flour, corn flour or corn meal? Is hominy the same thing as white corn? I can’t find masa harina here in Brazil or order it online. For any of you who don’t have access to Maseca or any corn tortilla mix, Alton Brown from Good Eats did an episode on tortillas and how you can make your own dough from scratch. You can find the episode on youtube, it’s called Tortilla Reform.